Scroll down to learn more about this free download. Plant these free downloadable paper flowers on presents or at your next soiree and watch the smiles bloom. Cluster these vibrant florets to create a bridal shower centerpiece, string them together for a festive wedding garland, or attach one to a gift for someone special. The petal possibilities are endless. To assemble the two designs, simply print the shapes, read the included directions for folding, and add a dab of glue to finish. 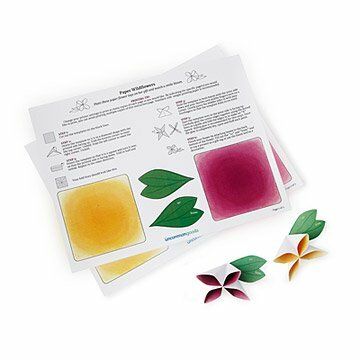 Click here for your free download of the Printable Paper Wildflowers. Click here for a step-by-step, illustrated how-to on our blog. Great for adding personalized touches to family gifts!